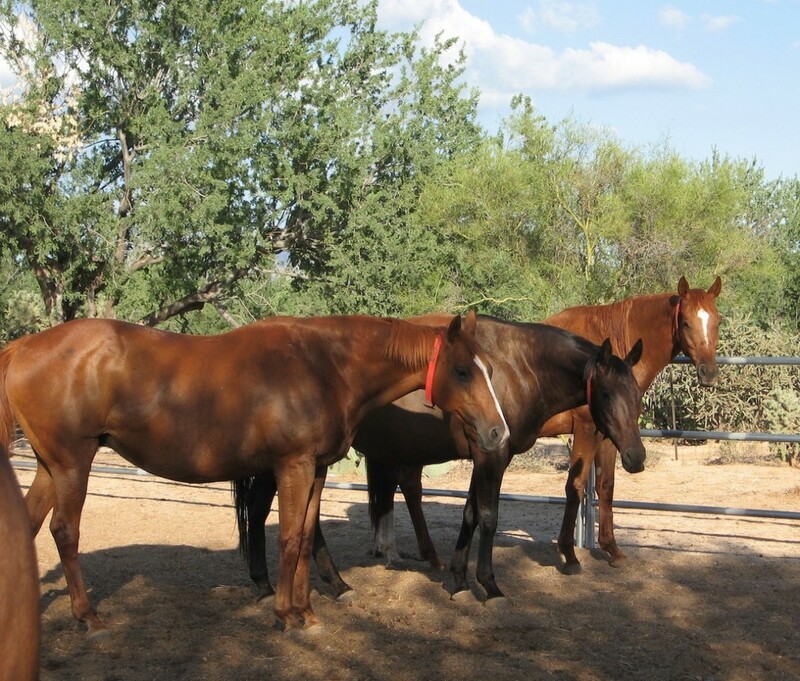 Following more than a week of difficult negotiations, 36 pregnant Thoroughbred mares and one stallion were removed from a Phoenix, Ariz., feedlot Aug. 15 and are now at two safe locations in the state, eventually bound for new homes. That’s the word from an exhausted Priscilla Clark, president of the horse retirement facility Tranquility Farms of Tehachapi, Calif., who spent the week in Phoenix trying to arrange payment and transfer for the animals. They faced an uncertain future — Clark believes the horses would have been slaughtered in Mexico — after they were transported from a Southern California breeding farm to the Phoenix yard. “We got ’em,” Clark said with relief after the horses were safely removed. “They are all out of there. Since their arrival in Arizona on or about Aug. 1, the horses had been squeezed into pens with about 100 other horses on a dirt lot the size of about two acres with no protection from the sun. She said she paid Dave Quinn, the individual who acquired the horses from Warren’s Thoroughbreds of Hemet, Calif., $750 per head. Clark estimated that was about twice what Quinn would have received at a livestock auction or by transporting them to Mexico for slaughter. The money to buy the horses was raised through private donations that came in after publicity about the horses. Many others, Clark said, stepped forward with pledges to adopt them. The process of identifying the mares is ongoing because acquiring the proper paperwork from Quinn and the Warren farm has been problematic, she added. However, she still plans to post the information on her farm’s Web site, www.tranquilityfarmtbs.org. once she returns to California. Quinn sold four of the original group of 40 mares to private individuals in Arizona, Clark said. She learned after arriving in Phoenix that just one of the stallions from the breeding farm, owned by Ben Warren, was there, the pensioned Seattle Bound. Four others, she said were “stashed” at a ranch in California, but are part of the lot she purchased. Two of the stallions she identified originally, Dante’s Inferno and Kris Kross, apparently never left Warren’s farm. Clark said that negotiations for the horses broke down several times because Quinn didn’t want to deal with horse rescuers. But she said that publicity about his operation and the number of people who were watching his yard forced him to eventually agree to sell. Warren said he gave the horses to Quinn, who told him he was taking them to a ranch in Riverside, Calif., but lied to him about his intentions. Quinn told Warren he wanted the foals of the broodmares to prepare them for sale as racehorses, and the stallions for future breeding. Quinn took the first group of horses by transport truck on July 27 and the rest two days later, Warren said. Clark became aware of the situation when contacted by a friend, Joyce Long, an Arizona bloodstock agent who heard about it before the horses were to be sold at an auction in Chandler, Ariz. A trainer in the Phoenix area, Steve Irlando, convinced Quinn to hold off on the auction and helped with the negotiations.